Who hasn’t had the urge to totally delete their internet accounts but the task feels so daunting, with hundreds of accounts you may have. How would you go about slogging through each and every gaming website, online store, music depository, social network? Believe it or not, there are options out there to ease the way for you. 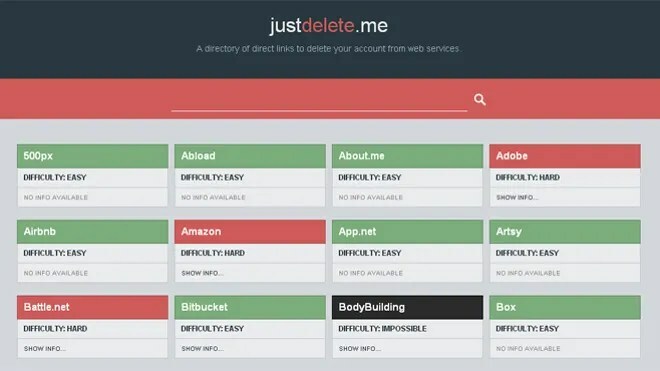 Launched last week by developer Robb Lewis and designed by Ed Poole, JustDelete.me provides a growing list of Internet-connected services, with links and information about the account deletion process. When available, direct links to account delete pages are provided. JustDelete.me also categorizes each service into “easy,” “medium,” “hard,” and “impossible,” depending on the difficulty of deleting an account from that service. The site also provides tidbits of information about account deletion for each service. You have a couple different options for this. You can pay a service like DeleteMe $99 to go through and delete all these results. Or you can follow DeleteMe’s own guide to do it yourself. Chances are you still want to use the Internet, right? In that case, you’ll need to set up a few things to ensure your data stays locked down. That means creating a fake identity. To do so, you can create an email address on a service like Gmail or Outlook with a pseudonym.Fake Name Generator is a great way to come up with a new identity complete with birthdate, and everything else. Interesting. I love searching the web and finding stuff I posted on yahoo groups 12+ years ago. I’m skeptical that you can really get your stuff completely off. How do they deal with Google cache & the way back machine? I’ve used both to find stuff that went missing or to prove someone said something when they tried claiming the hadn’t so my 1st thought was “what about”… Since the last thing I want to do is delete everything related to my multiple personas I’m not going to look into it. But if someone wants to “delete themselves” they need to consider all the various ways their data has been cached by third parties… & hey if they’ve been quoted somewhere they are out of luck. Once you’ve gotten on the net you cannot have everything related to you removed. People have shared, copied, quoted, possibly made memes, done back-ups of their stuff that includes the above… I have every email ever sent to any yahoo group I’ve been on for 12+ years. Umm too little space for replies my comments are tiny. Have you looked into using Disqus http://disqus.com/ ?